JP 2007-05-29 600 points ? US 2007-04-23 600 points ? EU 2007-04-27 600 points ? AU 2007-07-27 600 points ? 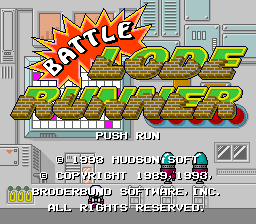 Battle Lode Runner (バトルロードランナー) is an entry in the Lode Runner series for the PC Engine. Turbo Technologies Inc. demonstrated a TurboGrafx-16 version at Winter CES 1993 and then again at Summer CES 1993, but this port of the game was cancelled. Sound design: Wss : Jin W.
Main article: Battle Lode Runner/Magazine articles.